But legal experts say these commissions can’t solve the problem alone. The justices’ comments came during argument last week in a pair of partisan gerrymandering challenges out of Maryland and North Carolina, which allege politicians drew voting districts to disadvantage the other political party. In North Carolina, Democrats say the state’s congressional districts were drawn to benefit Republicans. In Maryland, it’s Republican voters who are complaining that the districts have been rigged. The Supreme Court has struggled for decades to come up with a neutral way to police partisan gerrymandering, but hasn’t been able to settle on one. The chances for the high court to resolve the problem may have dropped last year with the retirement of Justice Anthony Kennedy, who was a swing vote on this ideologically divided issue. During arguments last week, some of the justices indicated that independent redistricting commissions, which take redistricting out of the hands of state legislatures and put it with a bipartisan or nonpartisan committee, might be a way for the court to stay out of partisan gerrymandering all together. To “what extent have states, through their initiatives, citizen initiatives, or at the ballot box in elections through their legislatures, amended their constitutions or otherwise provided for remedies in this area?” Gorsuch asked during last week’s arguments. The justices may find it appealing to point to ballot box initiatives as a reason for the high court to stay out of this issue. But experts say these commissions may not be the solution for many states. They can be difficult to establish because state legislatures have little motivation to cede the important power of drawing voter districts. The states that have already adopted independent redistricting commissions are generally “states in which those commissions were adopted over the dead bodies of the legislators by citizen initiative, passed overwhelmingly by the citizens and in the face of legislative opposition,” Emmet Bondurant told the justices in the North Carolina dispute. Only 18 states allow for a constitutional amendment via ballot initiative, according to the National Conference of State Legislatures. In the remaining states, independent redistricting commissions would have to pass through the legislature—something that could be a tough sell given that the gerrymandered districts are what got these legislators into power, said the University of Virginia’s Saikrishna Prakash. 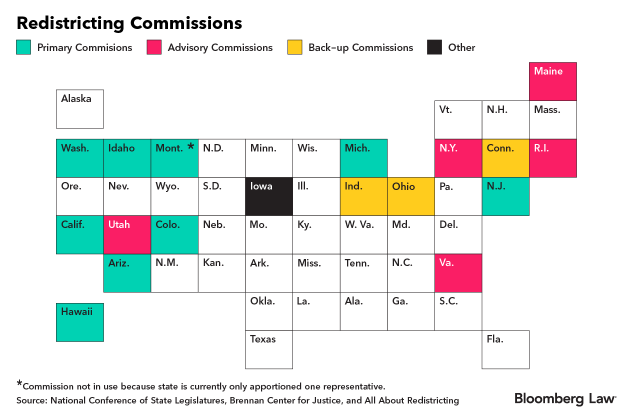 And even if they are successful in overcoming legislative opposition, it isn’t clear that these commissions can be set up in time for the next round of redistricting in 2021. While supporters of independent redistricting commissions initially feared that the newly reconstituted court might overturn its 2015 5-4 decision blessing these commissions, they appear to be on much sturdier ground following last week’s partisan gerrymandering arguments. It would be difficult for the justices to point to independent redistricting commissions as a way for other actors to thwart partisan gerrymandering only to later pull the rug out from under them, redistricting expert Michael Li said. Aside from further legal challenges, the path for nationwide adoption of commissions is bumpy at best. Democrats in Congress are attempting to mandate these panels in states via an omnibus bill (H.R. 1), which tackles everything from voting rights to ethics to political spending. But while the House passed the measure March 8 on a straight party-line vote, Senate Majority Leader Mitch McConnell (R-Ky.) opposes the bill and has said he won’t bring it up for a vote. Further, it isn’t clear that all states can adopt these panels. So far, independent redistricting commissions have been largely adopted in states, primarily west of the Mississippi, “that allow the people to amend their state constitutions without the consent of the state legislature"—and usually over its opposition—by initiative or referendum, Bondurant, of Bondurant Mixson & Elmore LLP in Atlanta, said. Currently there are 18 redistricting commissions, though the vary in their makeup and effectiveness. With few exceptions, “most states east of the Mississippi, including North Carolina and Maryland, do not allow the people of the state to amend their state constitutions without first obtaining the consent of the legislature which usually requires a super majority vote of both houses of the legislature,” he said. “While support for independent redistricting commissions is always well north of 70% for citizens across the political spectrum, legislators like the system that got them elected in the first place,” said Brian Cannon, who is leading the charge to establish an independent commission in Virginia. Therefore, there’s “a significant disconnect between our elected political leaders and those they purport to serve when it comes to this issue,” Cannon said. “Thus, the problem of partisan gerrymandering does not have a ‘political solution’ in the majority of states that do not allow amendments to their state constitutions by initiative or referendum,” Bondurant said. Political pressure, when combined with popular support, can lead to change, however, Cannon said. It certainly makes it harder for states to establish independent redistricting commissions without ballot initiatives, but it isn’t impossible, Li, of the Brennan Center for Justice, said. “That’s the path we’re on in Virginia,” Cannon added. In February, the Virginia General Assembly “passed the ‘first read’ of an amendment that would establish the first ever Virginia Redistricting Commission,” according to Cannon’s organization, One Virginia 2021. Voters must pass the “amendment again in 2020 without changing so much as a comma in order to” even get it on the ballot, the group said. And while that reform is meaningful, a similar situation isn’t going to happen in states where there is an overwhelming majority in charge, like Texas, Li said. The stars basically aligned in Virginia to get this effort off the ground, Cannon said. In particular, the state houses are almost evenly divided in Virginia, with the Republicans gaining a majority of the state House only after the Republican incumbent’s name was drawn out of a bowl to break an election-day tie. In such a world, it is easy for either side to see the other party in power, Li said. So there’s an incentive for both parties to support independent redistricting commissions, Cannon said. But certainly it is easier—and often produces more robust change—to get reform via ballot initiative, Li said. Cannon said he’s hopeful a Virginia commission, if it succeeds at the ballot box, can get off the ground in time for the next redistricting cycle, which occurs after the 2020 census. But Virginia is a bit different from other states because it has off-year elections, and is thus able to get a jump on the process of setting up the commission, Cannon said. For other states, it could be too late for them to set up a commission for the next round of redistricting if it isn’t on the ballot until 2020, Li said. If the Supreme Court doesn’t step in to stop the kinds of extreme partisan gerrymanders that occurred in both Maryland and North Carolina, legislators drawing district maps will understand that there are essentially no limits on what they can do when it comes to partisanship in redistricting, said Li. Those states will be facing at least another decade of extreme partisan gerrymandering, he said.